I don't know who else saw these on OBB but I decided to make them tonight for sunday dinner and they were mm mm good! The only ingredient I had to go get was some fresh rosemary but other then that they are relatively and easy make. And I would definitely recommend getting the fresh stuff. Also, put the pan on a rack closer to the top if you like them crispier. Preheat oven to 400 and line a baking sheet with aluminum foil (lightly crumple it if you want to; that will help ensure even browning) and spray with non-stick cooking spray. Set aside. Cut each potato into 8 wedges and set aside ( you can also cut them like you do for this recipe). In a large, wide bowl, combine the olive oil, salt, garlic powder, black pepper, corn starch, and rosemary. Add the potato wedges and toss to coat them evenly with the olive oil mixture. Spread evenly over the prepared foil and bake in the preheated oven for about 40 minutes or until the fries are golden brown. Remove from oven and sprinkle generously with Parmesan cheese and toss to combine. 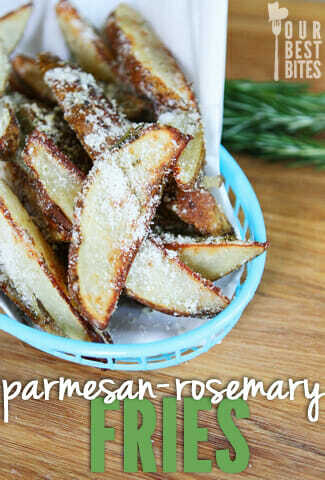 If desired, sprinkle with additional rosemary and salt. Serve immediately.